Brush the chicken breast with oil and season with white wine, black pepper powder and chopped herbs. Put in the fridge to rest for at least 40 minutes. Prepare the dough for the baskets: finely chop the almonds so to obtain a sort of flour. Arrange the two flours (regular one plus almond one) in a heap, make well in the centre with your hands, then add the softened butter cut into cubes and water. Knead quickly mixing well all the ingredients until you get a ball that you will put to rest in the refrigerator, wrapped in cling film, for about half an hour. Wash the salad, dry it with paper towels, cut into strips and set aside in a cool place. Thinly slice the apple, unpeeled, season with a little lemon juice and put aside in the refrigerator until use. Cut the bread into slices and then into cubes. Warm a little oil with a clove of garlic in a non-stick frying pan and toast the bread cubes until they are brown. Add salt and pepper and turn off. Heat the oven to 180 °C, roll out the dough into a thin layer on a floured surface, cut out circles and place them on the outside (upside down) of 4 round aluminium moulds of about 10 cm. Bake for 12 minutes, remove the mould, flip over the baskets and cook for another 5 minutes. Let it cool. Cook the chicken on a hot grill for about 4-5 minutes per side (it must be soft), let it cool before cutting diagonal slices. Prepare the sauce: put the egg in a blender bowl with lemon juice, vinegar, salt, the Worcester sauce and start adding the oil while beating everything with a wire whisk. At some point you should get a thicker sauce, similar to mayonnaise. 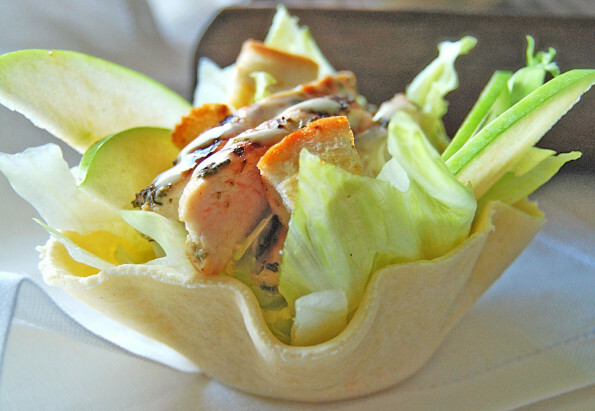 Assemble the appetiser: fill every basket with salad, a few apple slices, a few cubes of toasted bread, 3 slices of chicken, some parmesan flakes and season everything with a spoonful of sauce. The baskets can be prepared a day in advance and stored in foil so that they remain crispy. We would still recommend to pass them in oven at 200 °C for 3-4 minutes before filling them. This is a one pot course. If you are still hungry you can still serve some vegetable side-dishes with homemade bread or a cheese selection. Sauvignon blanc, Pinot grigio, Chardonnay or Chianti. The well known Caesar salad was first created by the Italian chef Cesare Cardini, who immigrated to the United States, San Diego, after World War I. In 1924 Cesare opened a restaurant in Tijuana, Mexico, where he invented this salad, which will then become famous in the US and subsequently in Europe too. In his salad, the chef aims at combining the typical Italian flavours - like Parmigiano, romaine lettuce and extra virgin olive oil - and the American ones - e.g. the Worcester sauce. The original recipe does not include green apple.